On February 18, 1974 Kiss released their first album simply called KISS. The songs were mostly Gene Simmons/ Paul Stanley songs from their former band Wicked Lester. The classic Kiss line up featuring Ace Freehley & Peter Criss had only been formed since 1972. The album took only three weeks to record during October/November 1973 at Bell Sound Studios. The album cover showed the bands faces against a black background, and was meant to imitate the Meet the Beatles album cover. Kiss were huge Beatles fans. Gene, Paul & Ace all did their own make up as usual but Peter Criss had a make up artist put his on and it was done in a different style than he was donning on stage. The album certainly wasn't an immediate classic, it only charted at #87 in the US but did sell 75,000 copies even though it didn't feature any hit singles. By the time Kiss hit their peak in 1977 the first Kiss album had gone gold. 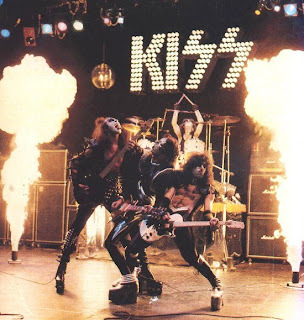 The album features some Kiss classics that became staples of their live shows. "Strutter"- one of my favorites was an old Gene Simmons song from his Wicked Lester days. The lyrics were written by Paul Stanley later on. "Cold Gin" is a classic Ace Freehley song. Ace was so insecure about his singing he gave the lead vocals up to Gene. At concerts later on in Kiss' career they both shared the lead vocal duties. "Fire House" was written by Paul Stanley when he was still at Music & Art high school in NY. 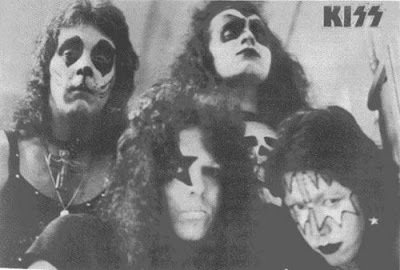 "Deuce" became the opening song for most Kiss shows until the 1976 Destroyer Tour & then again on the 1996 Reunion Tour. Gene Simmons wrote the song and claims even he doesn't know what the starnge lyrics mean. "Black Diamond" was a story about a 42nd St. prostitue and became another live staple for the band as did "100,000 Years" featuring Gene's bass solo intro and Peters drum solo. The strangest song on the album has to be "Kissing Time". 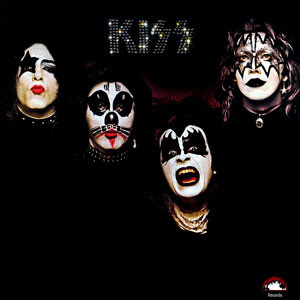 This was not on the original albums release but was added the following year by the record company against Kiss' wishes. The record company tried to boost sales by releasing "Kissing Time" as a single then throwing it on the album. It was a cover of a 1959 Bobby Rydel song & recorded during the albums sessions. The song was used to promote a Kissing contest for a radio station, the single only charted at #83.